In a large heat proof bowl, toss together the extra virgin olive oil, brie pieces, drained tomatoes and a pinch of black pepper. Set aside, covered, at room temperature for up to overnight. Bring a large pot of salted water to boil over high heat. Add the pasta, and when the water returns to a boil, remove the lid, and cook until your desired consistency is achieved, stirring occasionally. Drain out the pasta and immediately mix the minced garlic into the hot pasta. 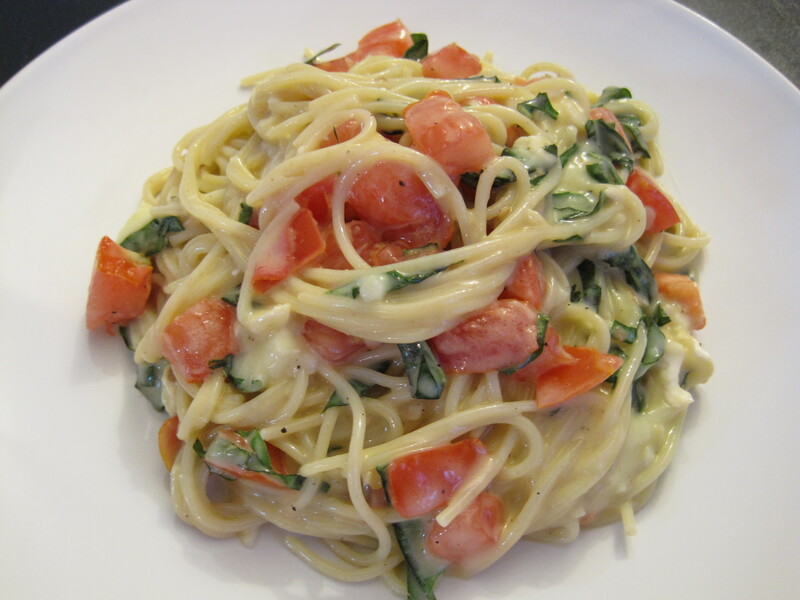 Then immediately toss the pasta with the oil, brie, tomatoes and basil mixture. Add salt to taste if desired, keeping in mind that the brie is already salty. The cheese will melt, the basil will wilt slightly and the garlic will have lost its bite. Serve hot. Oh yum. This looks amazing. You have a good neighbour!